Refugees have endured atrocities, but you can meet their physical and spiritual needs today. The ocean was their means of escape. But many refugees now living in Greece would have rather drowned than to be living in the deplorable refugee camps they call home today. “It was the worst physical place I’ve ever seen. There’s no hope left. 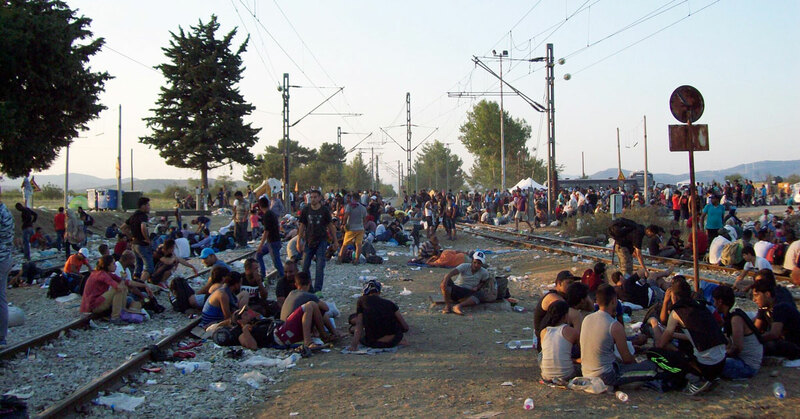 They’re hopeless,” is how a retired pediatrician from Chicago described the scene at the refugee camps in Greece. These refugees are living in squalor, and the greatest battle they face is the war against hopelessness. Poor living conditions, post-traumatic stress disorder, and fear of the future have led to a spike in refugee suicides and other mental health issues including depression and anxiety. There have even been reports of children as young as 10 trying to end their suffering in the Greek refugee camps by taking their own lives. But you can lend a helping hand. For $35, you can provide $189 worth of emergency relief for a global refugee — whether he lives in Greece, Uganda, Syria, or elsewhere. Medical care is one of the most urgent needs. And when you give to help a refugee, you’ll be providing aid like trauma counseling, medication, crutches, and wheelchairs. One of our partners in Greece was in disbelief at the state of some of the refugee camps, especially the buildings that house new arrivals. The New York Times reported that many refugees stand in line for up to 12 hours day waiting for food, that there is just one toilet per 70 people, and that raw sewage oozes into families’ sleeping quarters. Unfortunately, these conditions are normal for refugees around the globe. While the few doctors and medical professionals try to heal physical wounds and calm broken spirits, refugees urgently need the hope found in Jesus in order to survive. But for a refugee to truly find complete healing — and be receptive to the Gospel — all of his needs have to be met: physical, emotional, and spiritual. When you give $35 to provide emergency aid, you’re also giving the priceless gift of hope for a refugee barely hanging on. You are introducing someone to the love of Christ when you help provide food, clean water, medical care, hygiene kits, and durable clothing and blankets. And thanks to generous corporate donations and grants, your $35 gift multiplies five times to provide $189 worth of lifesaving supplies. Refugees have seen little peace and love during their lives. War, violence, and poverty plague their past and their present. But by showing them compassion through your generous giving, you’re showing them that love and peace do exist … in a relationship with the Son of God. Today, will you help give a refugee the best possible care in the worst conditions?